Rose L. (nee DiRenzi), Age 98, of Malvern PA, on March 1st 2019. Beloved wife of the late Anthony C. DeAngelis, Sr.
Loving mother of Anthony C., Jr (Mary), Michael A. (Cyndy), and the late: Bernadette C., Mary Ann R., and Nancy DeAngelis. 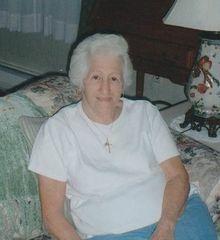 Cherished grandmother of Anthony M. DeAngelis. Great-grandmother of Adrianna Heckman. Precious daughter of the late Mary Ann (nee Amoroso) and Antonio DiRenzi. Devoted sister-in-law of Richard DeAngelis (Pam). Predeceased by her beloved three sisters and eight brothers. Relatives and Friends are invited to her Viewing on Friday, March 8th, from 10:00 AM – 10:45 AM, at the D'Anjolell Memorial Home of Broomall, 2811 West Chester Pike, Broomall PA 19008. Funeral Service to follow at 11:00 AM. Interment Sts. Peter and Paul Cemetery. In lieu of flowers, contributions in her memory to The American Cancer Society, P.O. Box 22478, Oklahoma City, OK 73123 would be appreciated. Rest In Peace Aunt Rosie.